Gary May 26/12/16 ... "I obtained this (rare) beauty from Bob Hudson a few years ago. It flowered and was self pollinated recently and then remounted, should make a nice little clump. There are 5 offsets at present but I'm hoping it has the energy to create another 2 for a bit of symmetry." Derek Butcher 27/12/16 ... "Gary: I was waiting for some comment on your oddity. 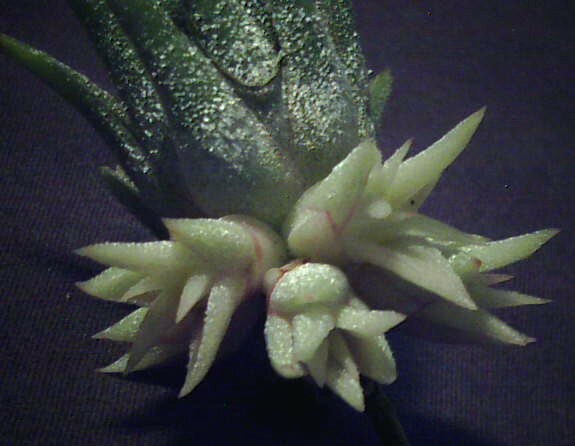 It is certainly rare because it seems the offsets have sported to true albino and the leaves not normal ionantha shape. I would suggest they will only survive as long as 'mother' lives because of lack of chlorophyll. Send us a photo in 12 months time." Gary May 27/12/16 ... "Over the last week the offsets have changed shape to resemble ionantha Peanuts offsets AND more importantly the white leaves now have a tinge of green. The offsets may look an odd shape but that's because I'm an odd person. I hung the mother by her toes attached to a fishing swivel after she produced the quintuplets. As you know ionanthas are un-killable and the offsets have started to re-orient their growth upwards. 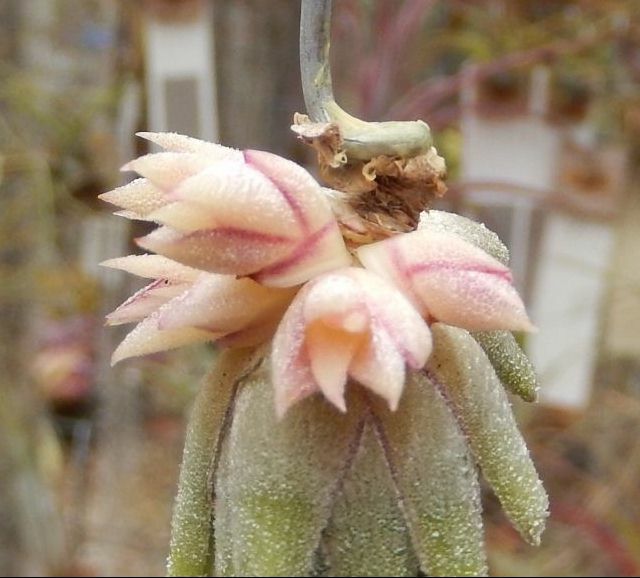 My last memories of the original plant was that the centre of the ionantha was white with red tips and the outer, older leaves were green with red tips. That was before Easter 2016 and I decided it should be relocated to a safer spot in the garden." Bob Hudson 27/12/16 ... "I have sent Geoffry a photo of the offsets I have taken off my plant and they do survive. All the Minnie whites in Australia are off my original plant." 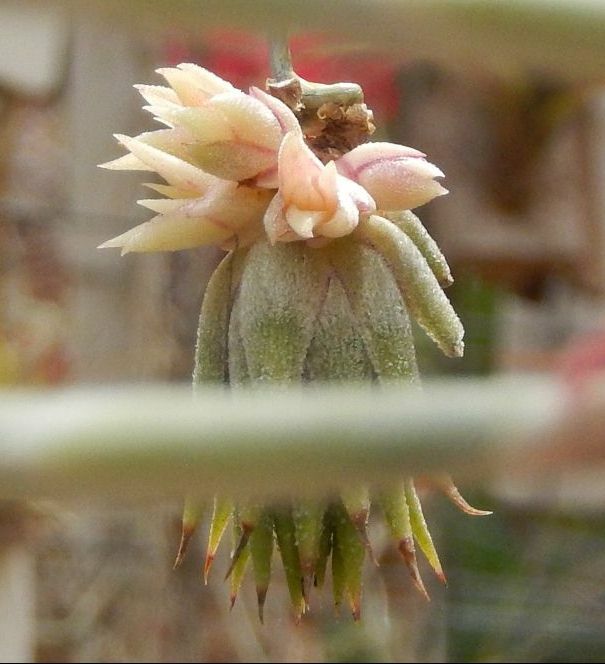 From BCR ... "Seed parent = ionantha, Bob Hudson Qld. Tiny miniature rosette to only 4cms. high at maturity. Light green leaves tipped pink in strong light and covered in fuzzy white trichomes. Some leaves redden at blooming plus extended tubular mauve flowers. 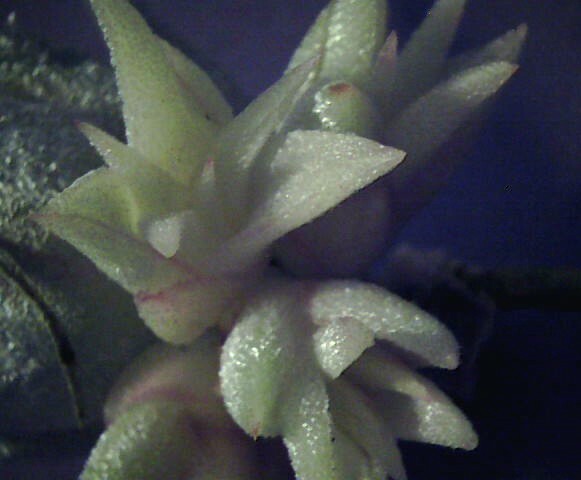 Emerged from a seedling batch of T. ionantha, but unknown if it's a hybrid or mutant species seedling. After 10 years this clone has remained small. Ionantha Group. Reg. Doc. 10/2013." Gary May 26/12/16 ... "In November the offsets were white with red borders. January, the offsets have now taken a very light green tinge and the red borders have mostly dissolved."